A company owned by Team Systems (VIC) PTY LTD. The secret’s in the occupational Health and Safety award winning axle design. This means a greatly reduced risk of injuries such as shoulder strain, hernia and spinal disc compression. “Our staff love them because they make their work so much easier” – Rick Streefland, Streefland’s Transport, Launceston, TAS. so the axle can “float” & tilt the trolley backwards. You won’t believe heavy loads can feel so light. 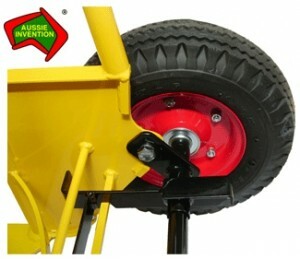 Axle lock re-engages automatically when the trolley is returned to its upright position.